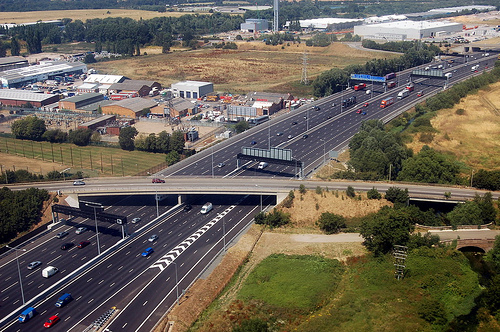 How Many Speed Cameras Does It Take to Catch a Speeding Motorist on the M25? I kind of like speed cameras. This probably comes from not having seen one since I moved away from the UK. This means that I associate them with orderly driving and sticking to the law and I would love to see some set up over here. However, not everyone likes our photo taking buddies and those who don’t like them will be jumping up and down and waving their fists in an angry way when they hear about the new cameras on the M25. The system includes 36 spanking new digital cameras which are designed to catch speeders on the motorway which goes around London. The road is over 100 miles long and with half a million drivers using it every day it is one of the busiest stretches of road in the known world. So how many speeding motorists have these modern cameras caught in the last year? Err, none. Of course, the fact that the blooming cameras aren’t switched on is probably part of the reason why this is. 2009 was the year when these cameras started being set up on the M25. However, the Highways Agency still doesn’t have the necessary authority from the local authorities to let them use this current generation of speed cameras on the entire road. It seems though the cameras which do have permission have “technical” problems, which is a description which could cover a multitude of sins. Some of the new cameras haven’t even been tested yet. The road agency said that it is looking into the matter with police as a “matter of urgency”, which is nice to know. A number of politicians and campaigners were quick to criticise this state of affairs and it would be nice to think that our friendly speed cameras will be up and running before too long. In the meantime, let’s hope that drivers on the M25 use their common sense, although there are still police officers there to catch speeders as well. This entry was posted in Musings and tagged digital cameras, Highways Agency, London, MoT, motorists, police officers, speed, Speed Cameras, UK by Robert Bell. Bookmark the permalink.